Its not fancy. Its not pretty. Its a teeny bit fiddly. But heck, its cheap and it works. 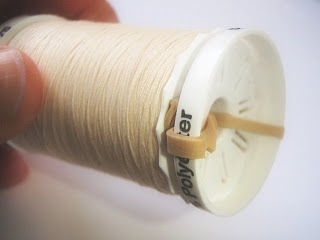 I have started using rubber bands to match up my spools of thread and bobbins. The band keeps the thread on the bobbin secured, too. Find a rubber band. Poke it through the spool of thread. You might need a long, thin, pointy thing (tailor's awl, doll's needle, skewer) to help guide it through. Now hold each end tightly (or the band will keep springing out and you will feel like stabbing yourself with the long, thin, pointy thing). Wind it twice around the bottom of the spool to anchor it. 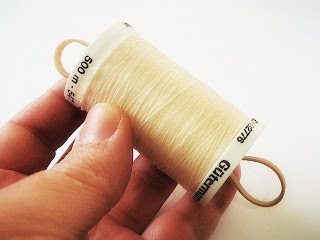 Place the bobbin at the other end of the spool and feed the rubber band through the middle. Pull the rubber band nice and tight and wind it several times around the bobbin to secure it. Et voilà! Organised bobbins for next to nothing. Wonderful idea, Liesl! 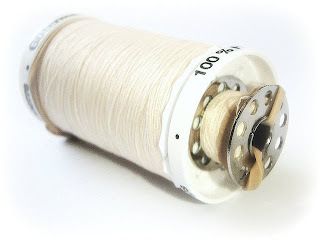 Must try this - I am always losing my filled bobbins. Now if only I could find the new ones I bought yesterday... While typing this I am reading your live traffic feed - am tickled that you had a visitor from Staines in England; many moons ago as a recently married young journalist I worked for 6 months on the weekly paper there. Great fun. Hope you and all in the Hoppo Bumpo gang are well. Great idea! I am such a lazy pants that I leave white in the bobbin (unless I am sewing blk or blue or red etc). Damn you're a clever chook. All that's in my way of organisational bobbin nirvana is the LOCATION OF EVEN ONE RUBBER BAND. They're an extinct species in this house. Or give you some kind of award! Or bake you a cake! I know what I'll be doing tonight! Nice, although my rubber bands don't last long - they dry out and crumble. Rotten rubber bands? My solution was not as cheap, even more fiddly but it's great once it's done. I bought boxes, .6L Realy Useful Boxes, which fit my favoured Gutermann threads perfectly rows of 6x4. Then I created a card insert with boxes, marked a hole in the middle and used my pattern drill to cut through - all 24 holes x the number of boxes. Wait, it gets worse! The real Play School element was the plastic drinking straws. But into lengths the height of the box + 1cm or so. Then I cut slits (4 of) in that 1cm section, poked through the hole and spread the 'legs' on the underside. This was then secured with sticky tape (very Play School). 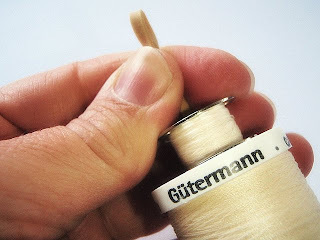 You can put the Gutermann spool onto the straw 'spike' and there is exactly the right amount of room for the bobbin to fit on top. I have a LOT of thread. I now have a LOT of bobbins. I need to get out a LOT more. Like I said, not cheap, not less fiddly, more work. Such cleverness! I will be searching the house for rubber bands tonight, seriously in need of bobbin organization! Wow! I didn't know there was any such thing as bobbin organisation. Can you come play at my place? This is such a fabulous idea. THANK YOU so much for sharing. Brilliant. You are such a very clever woman. It would be a little redundant for me to say how clever you are, right? Liesl, you are a genius! Love it! Thank you so much for this post! I just brought a walking foot for my Janome 625E for almost $40 and was annoyed to see no instructions! I printed this post and can't wait to start quilting! I am going to try this - thank you! I think I will try this. Right now I use the crafty fuzzy sticks and cut this in half. I use my needle nose pliers and turn the ends down a tiny bit or they scratch. I make a bar at one end just enough so it won't slip through the spool; put the other end through the spool and bobbin and fold it over the bobbin. they stay together which is all I want. 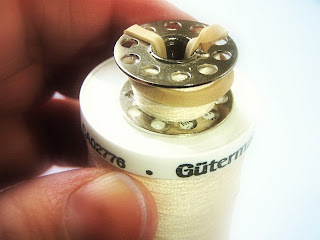 It's very good idea to get easy way to bobbin.. I take a clear quart size Ziploc bag , sew two vertical seams about two inches apart , don't catch the zip at top of bag, and l put bobbins in same color scheme. Works really well.